Explanation: On November 8, a waning crescent Moon joined the continuing parade of planets in Earth's early morning skies. 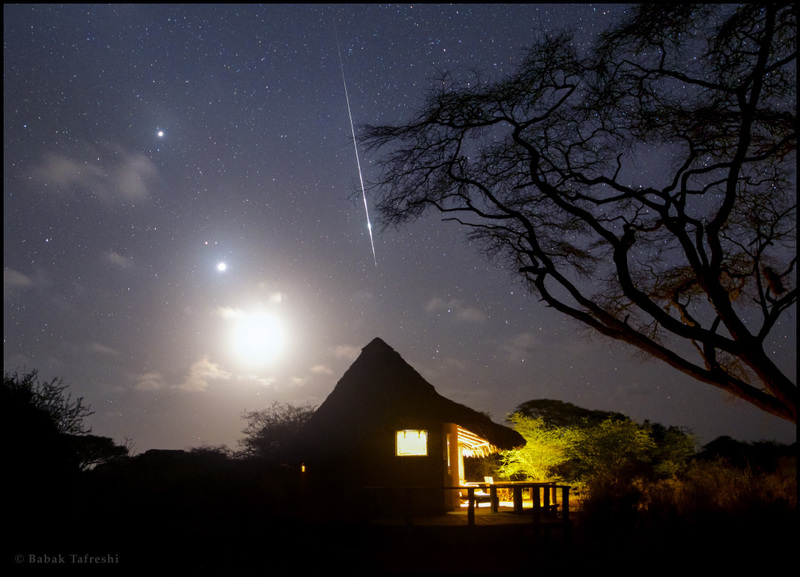 Captured here from Amboseli National Park, Kenya, even the overexposed moonlight can't washout brilliant Venus though, lined up near the ecliptic plane with faint Mars and bright Jupiter above. As if Moon and planets aren't enough, a comparably bright Taurid meteor also streaks through the scene. In fact November's Taurid meteor showers have had a high proportion of bright fireballs. Apparently streaming from radiants in Taurus, the meteors are caused by our fair planet's annual passage through debris from Comet 2P/Encke. The comet's dust grains are catching up with Earth's atmosphere at a relatively low speed of about 27 kilometres per second.